Italy appears to have its fair share of impressive, well-preserved castles that not only look fantastic in the Italian context but also in that of all of Europe. Easily distinguishable from its neighboring countries’ counterparts, Italian castles incorporate not only traditional elements of medieval military architecture and Gothic architecture, but also those of the Italian Renaissance, Byzantine, and Moorish architectural styles. Outstanding with their geometrical shapes and imposing appearance, Italian castles are not only awe-inspiring but absolutely marvelous – a splendor that is best observed in person. Interestingly, no two castles seem alike and each has unique features that correlate with historical events, natural surroundings, and political changes over the centuries. It is also worth noting that castles in Italy aren’t concentrated in only one or two regions, but cover all country, which is clearly reflected in the following list of the 15 best castles in Italy. Castel del Monte in southern Italy in the region of Apulia is not only one of the most significant castles in the country, but has also been recognized by UNESCO among its World Heritage Sites due to its unique and truly awe-inspiring significance. The 13th-century castle and citadel is a distinctive example in medieval military architecture since it successfully combines various architectural elements from the Islamic Orient, classical antiquity, and European Cistercian Gothic styles. Castel del Monte is renowned for its perfect regular octagonal prism shape. In each corner there is also an octagonal tower. The castle was built by Emperor Frederick II and its building has only been documented in a single document dating back to the 1240s. The castle has beautifully restored, however, most of its ornaments and marbles were looted in the 18th century. 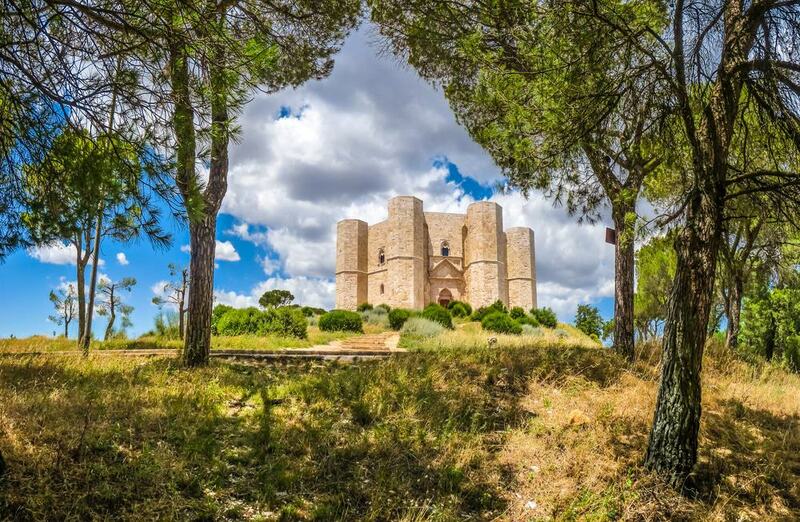 Castel del Monte has been recognized by UNESCO since 1996 and the castle is also featured on the one-cent coin of the Italian issue of the euro. Fénis Castle is one of the most famous in northern Italy and lies approximately 50 kilometers south from the border of Switzerland. 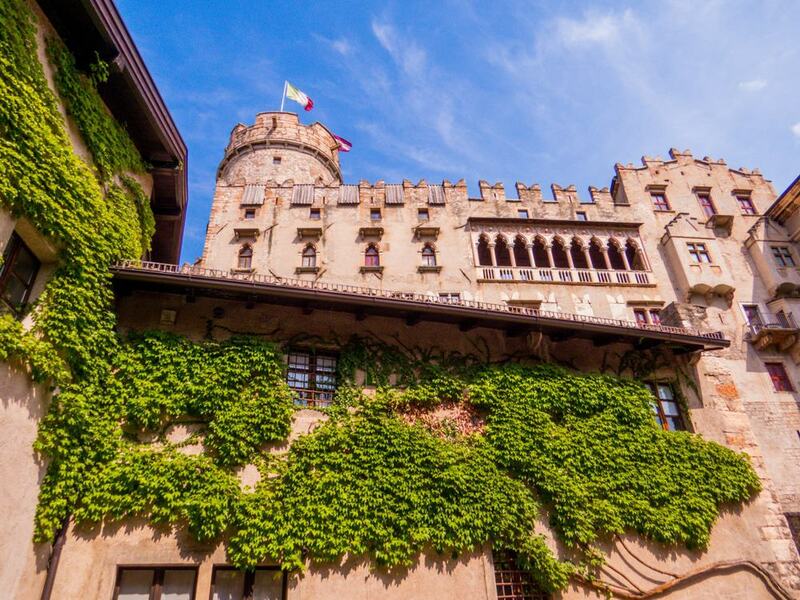 The castle is located in the Alpine Aosta Valley with an impressive mountainous landscape that together with the many towers and battlemented walls help create a truly dramatic look of Fénis Castle. Interestingly, despite its defensive appearance, Fénis Castle was never intended to be a military structure. Instead, it was a prestigious seat of the Challant family. Nevertheless, the castle has numerous watchtowers, a double boundary wall with battlements, as well as towers in each corner of the pentagonal layout. It’s not just the exterior of the castle that inspires fascination with this unique structure. The inner courtyard also is worth mentioning since it features not only a semi-circular stone staircase but also wooden balconies and a 15th-century fresco depicting Saint George dramatically killing a dragon. 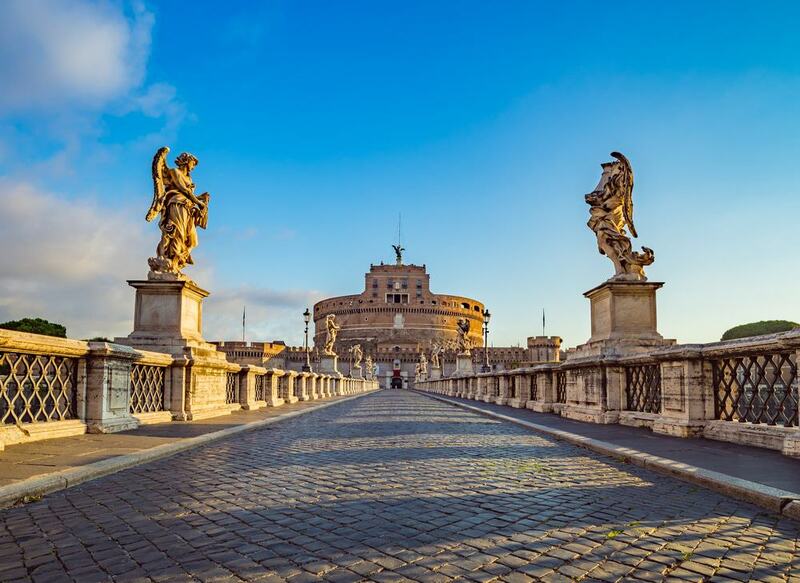 Castel Sant’Angelo is among one of the most significant historic buildings in Rome. Located in the Parco Adriano park on the northern banks of Tiber, Castel Sant’Angelo is a fortress and a castle built between 123 and 139 AD and was originally built as a mausoleum for the Roman Emperor Hadrian. While his and his family’s ashes as well as those of succeeding emperors were indeed placed in the mausoleum, the building was later used by popes as a fortress and a castle. Nowadays Castel Sant’Angelo is a museum. Sadly, many of the most valuable contents in the mausoleum including tomb components and decorations have been lost, damaged or destroyed, when the building was converted into a military fortress around 401 AD. Not only that, but also the urns and ashes were scattered around the same time by Visigoth looters. Centuries later Castel Sant’Angelo was transformed into a papal castle. Moreover, the castle was connected to St. Peter’s Basilica in the Vatican via a covered fortified corridor which proved itself useful in 1527 during a siege which was a part of Sack of Rome. The castle has served as a museum since the beginning of the 20th century and receives over 1 million visitors each year. 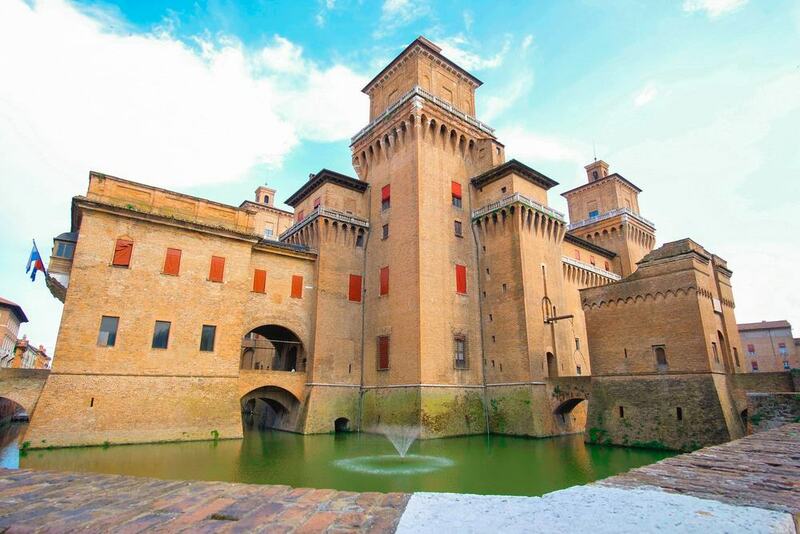 Unique in its appearance but absolutely appropriate for the Italian landscape, Castello Estense or Estense Castle is a moated medieval castle in the north Italian city of Ferrara. The building of the towering castle began at the end of the 14th century, in 1385. It was commissioned by Nicolò II d’Este as his family’s residence and also to protect them from the revolting citizens of the city. 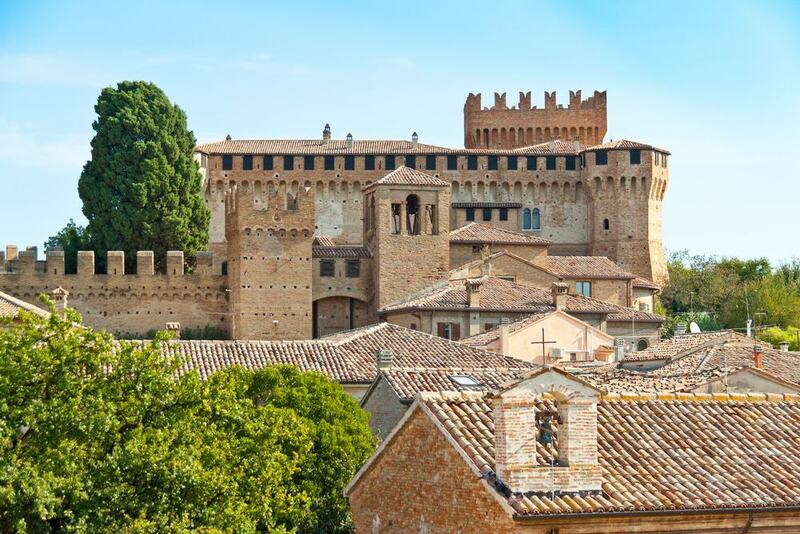 The imposing exterior of the castle is defined by four towers, each symbolizing the magnificence and power of the Este family and are named: Torre di Santa Caterina, Torre dei Leoni, Torre Marchesana and Torre di San Paolo. Torre dei Leoni is also open for visitors, who can climb to the top and admire splendid views of the city and surrounding landscape. 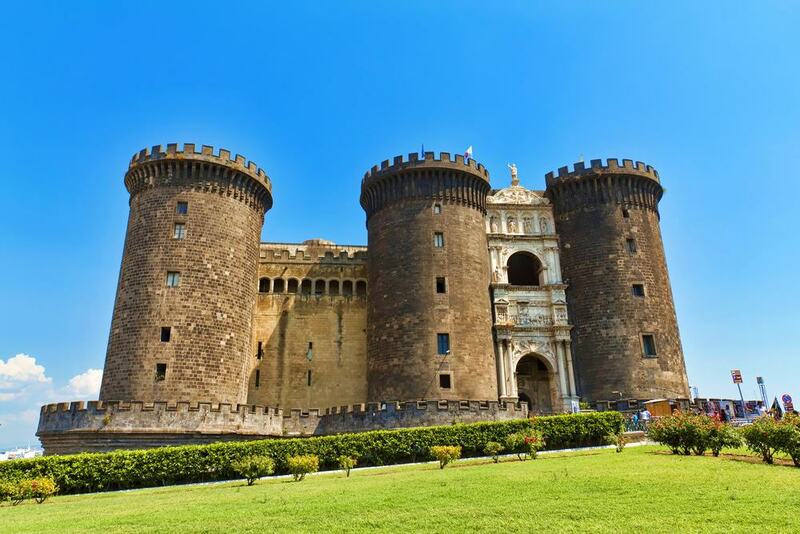 Castel Nuovo is one of the main attractions in the southern city of Naples. The medieval castle built in the late 13th century is often also referred to as Maschio Angioino meaning Angevin Keep. Until as late as 1815, the castle was a royal seat for kings of Naples, Spain, and Aragon. The original architectural plan for the castle was drawn up by the French architect Pierre de Chaule and the building of the castle was initiated by Charles I of Anjou. While both the Angevins and succeeding Aragonese used the castle as a royal palace, filled with culture, art, and other royal significance, the Aragonese transformed the castle into a fortified structure that can be seen today making it also increasingly larger and more imposing than as it was during the Angevin rule. The castle is built in a trapezoidal shape with five large cylindrical defensive towers. Three of the towers are placed on the same wall, that which also features the entrance to the castle, which is notably outstanding. The entrance consists of a single-sided white marble arch which clearly stands out from the rest of the structure. Gradara Castle in central Italy in the region of Marche is medieval fortress dating back to around the 12th century even though further building works took place until as late as the 15th century. A significant reason why the castle is so famous is not only due to its beautifully-preserved structure but also because it was featured in the famous Divine Comedy by Dante Alighieri. The castle has a 30-meter tall keep which is protected by two walls – outermost stretching for nearly 800 meters. Visitors are welcome to explore not just the outside but also the inner parts of the castle which features chambers, halls, and historic artifacts. When thinking about historic structures perched atop a mountainous islands, most people will immediately think of the famous Mont-Saint-Michel abbey in France. 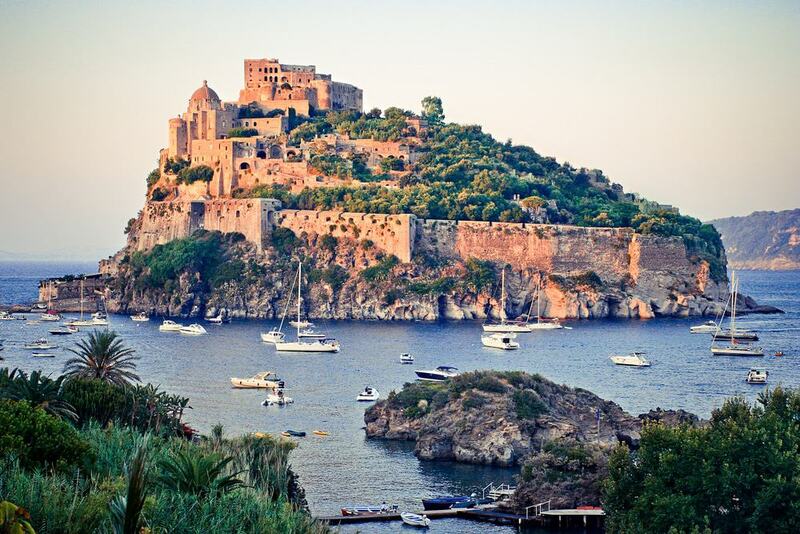 Yet there’s another which deserves recognition and it is the Aragonese Castle in Italy, built on and in the very essence of the volcanic rocky islet next to Ischia to which it is connected by a causeway. Worth noting is the fact that the oldest parts of the castle date back to remarkably distant times – it was built by Hiero I of Syracuse in 474 BC. A century later the territory was captured by Romans and after that by the Parthenopeans, who were the ancient inhabitants of Naples. In the mid-15th century the islet was connected to Ischia with a stone bridge which replaced the previous wooden structure. On top of that the castle walls were also fortified to defend the inhabitants from potential pirate raids. 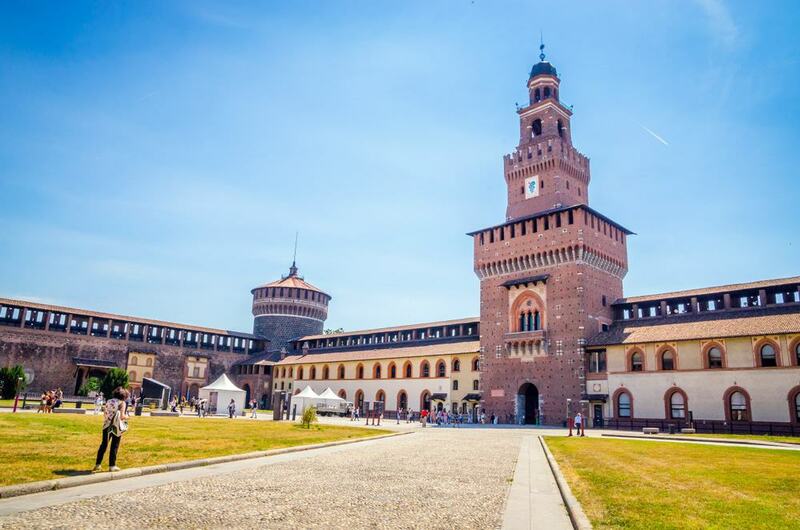 Sforza Castle is a noteworthy and significant historic structure at the heart of Milan. Built by the Duke of Milan, Francesco Sforza, in the 15th century atop a previous structure from the 14th century, particular attention was paid to the decorative elements – sculptors, architects, and painters all were hired to work on the central tower to make it a truly royal-worthy space. To this day this unique tower is recognized as one of the most significant landmarks in Milan. In late 15th century even Leonardo da Vinci contributed his work to painting frescoes in the castle. Despite its regal beginnings, gradually over time the castle was transformed into a military structure. Only in the 19th century the castle was restored to its former glory and to also serve as the headquarters to Milan’s Civic Museums. Unlike the majority of Italian castles, Miramare Castle is a later addition to the country’s spectacular cultural heritage. Dating back only to the 19th century, it nevertheless has a remarkable appearance and thus deserves to be on the list of the best castles in Italy. 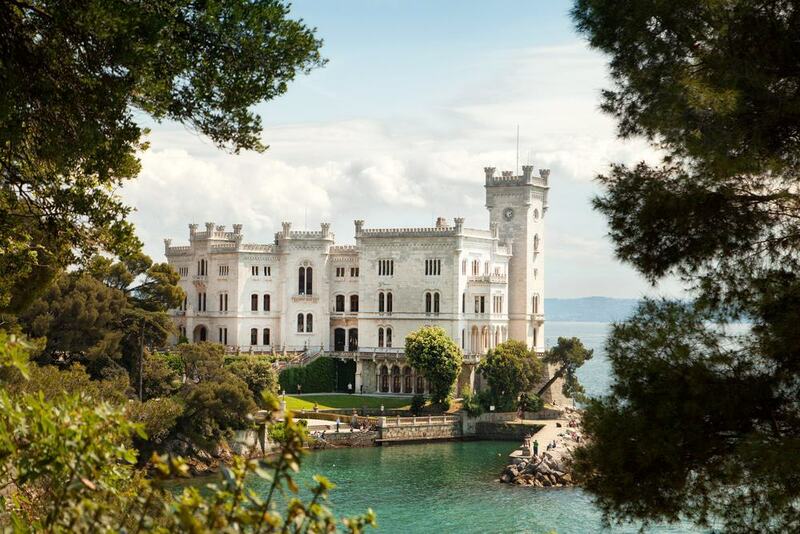 Located at the very northeast of the country, Miramare Castle overlooks the picturesque Gulf of Trieste and its turquoise waters. Built over four years starting in 1856, the castle was intended for the Austrian Archduke Ferdinand Maximilian and his wife. The design of the castle was created by the Austrian engineer and architect Carl Junker. In a true manner for 19th century castles, the castle grounds include an impressive seashore park which was completely transformed to be able to accommodate a vast array of tropical trees and other plants. While the original fortified building stood here from the 13th century, Buonconsiglio Castle as we see it today was mainly designed during the Italian Renaissance period. Until 1803 it was the residence for prince-bishops but was later acquired by Austria and used by its military as barracks and later as a jail. Because of this, the castle fell into decay until the 1920s when the city of Trento was returned to Italy and the castle along with it. For the past three decades the castles houses the Provincial Gallery of Art. The castle features spectacular frescoes and a beautiful Venetian loggia overlooking the city of Trento. The inner courtyard is an excellent example of Italian Renaissance architecture. Some people see similarities between Palazzo d’Accursio and Sforza Castle in Milan, however, the castle in Bologna was originally built with the intent of housing civic and administrative offices. 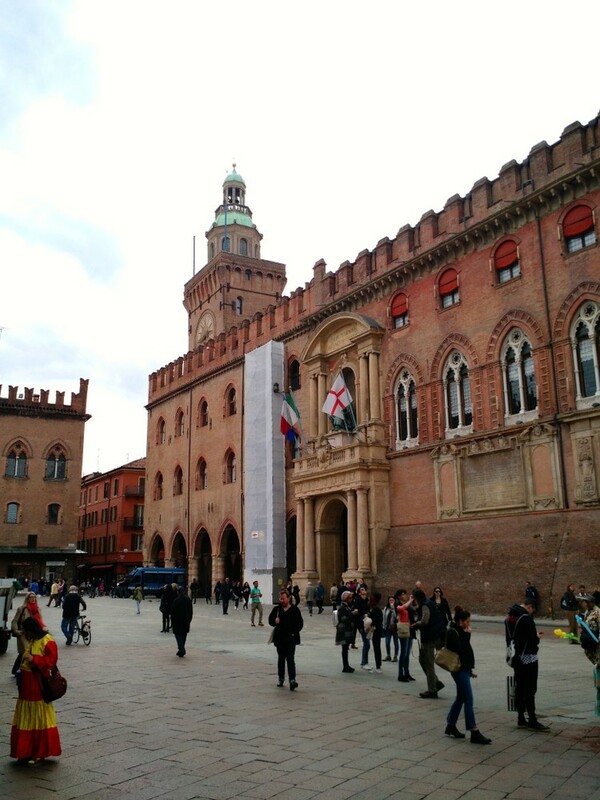 Today it’s the town hall of Bologna. While some of the original structures date back to the 13th and 14th centuries, the main enlargement and renovation took place in the first half of the 15th century, when a clock tower was also added. Essentially, Palazzo d’Accursio is a complex consisting of several adjoining buildings that have been connected over the years. The impressive facade features a terracotta Madonna with Child by Niccolò dell’Arca. 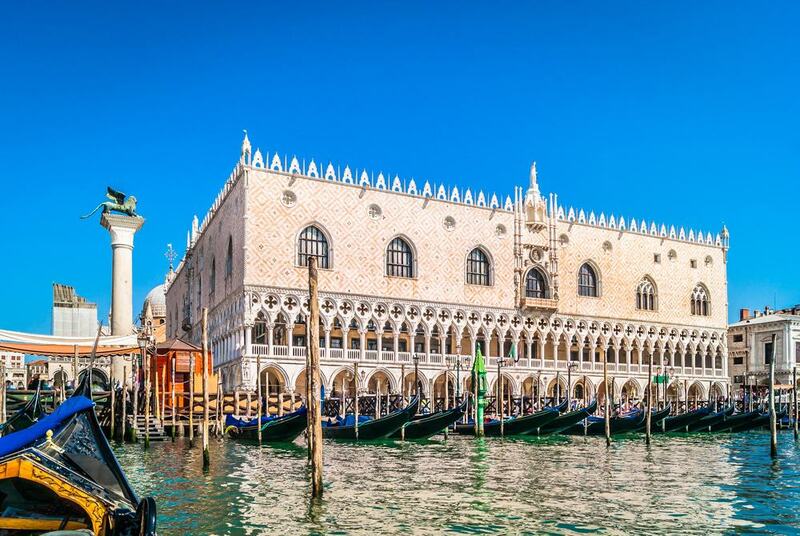 It’s impossible to look up images from Venice without coming across Doge’s Palace, which is, without a doubt, one of the most significant landmarks in one of Italy’s most-visited and beautiful cities. The palace is an important and excellent example of the Venetian Gothic architecture, renowned for its Gothic, Byzantine, and Moorish architectural elements. Following two major fire incidents in the 14th century, Doge’s Palace was rebuilt in its current-day appearance. Since 1996 Doge’s Palace houses a part of the Venetian museum network. While the majority of people visiting Verona go there to see the famous balcony featured in Shakespeare’s Romeo and Juliet, it’s not the only significant attraction in the city. 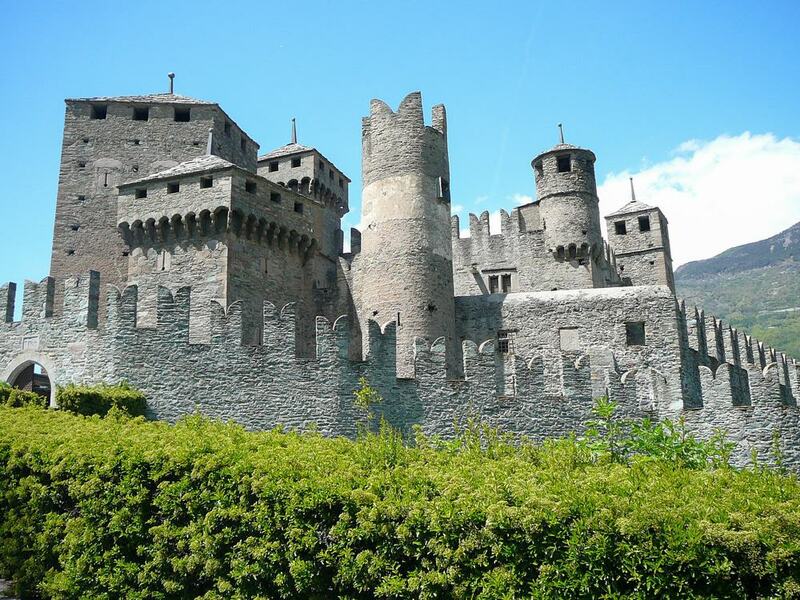 Castelvecchio – meaning Old Castle – is a significant medieval military fortification belonging to the Scaliger dynasty. Built in the mid-14th century, the castle features very few decorative elements and is very strict in its composition. 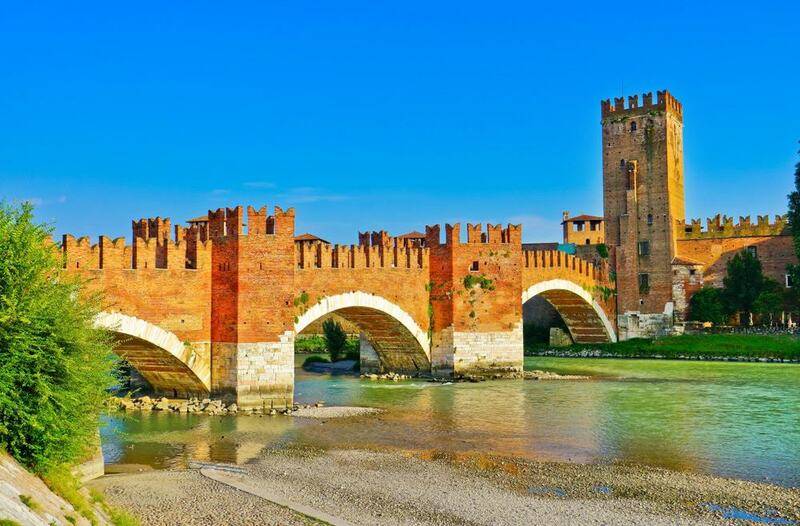 With seven towers and imposing walls, the castle was supposed to defend the people of Verona. The castle stands out in the overall castle landscape of Italy with its red brick structure and arches. Most people would assume that Tyrol Castle is located in Austria since it is generally accepted to talk about Tyrol in an Austrian context. Nevertheless, the region is spread over both Austria and Italy, and the ancestral seat of Counts of Tyrol who gave the whole region its name, is actually located in Italy. While this region has been inhabited since the ancient times, the castle itself dates back to the early 12th century even though building work and expansion took place at least until the 14th century. 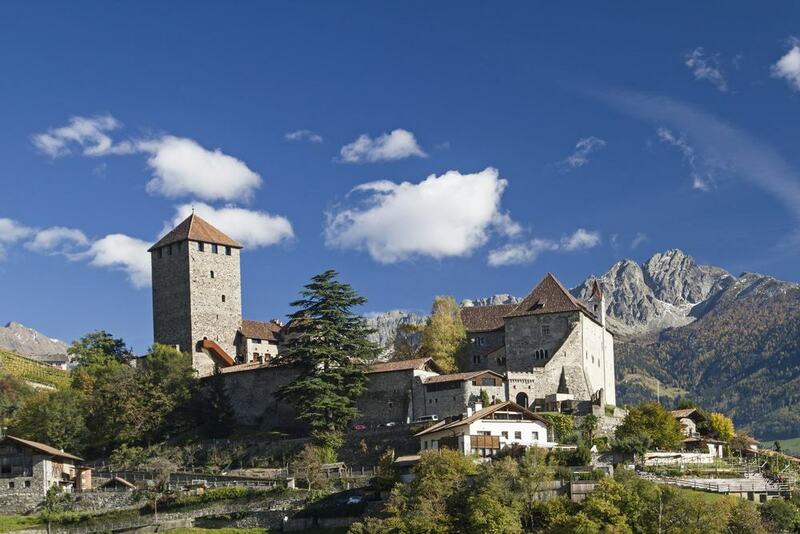 The castle boasts impressive views of the surrounding Adige Valley and the whole setting is both serene and majestic. Nowadays the castle houses the South Tyrol Museum of Culture and Provincial History. The castle is remarkably well preserved and restored, and there’s a vast array of both internal and external parts that the visitors can admire: from the Inner and Outer baileys to the Knight’s Hall and Upper Chappel and Keep. 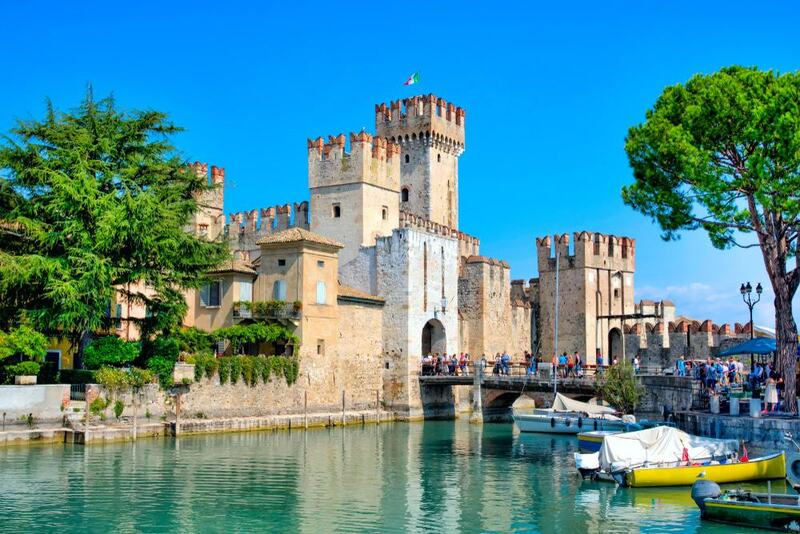 A true Italian marvel, the Scaligero Castle is also known as the floating castle due to its location on Lake Garda. Historically it was the entry point and the center of the Sirmione community. Scaligero Castle is one of the best-preserved Scaliger era castles. It was built atop of a previous structure around the 13th and 14th centuries, and occupied by the House of Visconti for a brief period before the 15th century. The castle territory also incorporates a small harbor surrounded by ramparts where bowmen were positioned to protect both the fortification as well as the water inlets.